The Calypso Cream flavored coffee is an island dream with its fusion of coconut and Jamaican rum flavors. 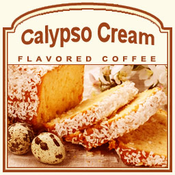 With a warm and inviting aroma, the Calypso Cream offers a full-body of fruity flavors with spicy flair. Each cup only has 2 calories, so you can truly indulge like you're on a tropical vacation in paradise. These fresh roasted Arabica beans will give you quite a warm blend of succulent sweetness. Packaged in a heat-sealed valve bag, we ensure that the freshest Calypso Cream will arrive at your door! Roasted and shipped on the same day, this flavored coffee will be a perfect way to wind down from a long, busy day at work and let yourself drift into an island living state of mind.